24 Hour Room Full? Study Somewhere Else! Everyone loves the library; but what are some other places around campus where students can pull out their laptops, relax and get some work done? There’s plenty of locations around that are perfect for studying for your physics midterm or to work diligently on a essay. Here’s a few. Firstly, everyone seemingly goes to the Ram’s Den to grab a quick bite between classes. However, it is not yet widely known that Ram’s Den is actually open from the hours of 5pm-11pm too. While no food is served, the entire cafeteria is open for usage. This spot is great for meeting to work on group projects, and there’s often plenty of room to work. But beware: there are not many outlets, so make sure your laptop is fully charged! While small, the Dunkin Donuts facilities located on campus make for great study spots. While packed and loaded during rush times, when business slows down, usually later in the day and into the evening, it empties out, leaving plenty of room to study and get work done. They play pretty good music, too! Next up, for places on campus, is the newly renamed pharmacy building, Avedisian Hall. Recently built, the building always has a cool temperature maintained within. Furthermore, after 5 p.m. passes, although some classes remain in session, the building is open for hours, and students are welcome to visit it to get some work done. There are lounges scattered throughout, and it is often a low-traffic place once the sun has set. This study spot is perfect for students looking for some valuable, after-dark solitary study time. Lastly, for students who wish to experience the outdoors while studying, URI’s botanical gardens make for a great fall/spring study spot. Not particularly practical for the winter, due to the lovely New England January-March timeframe. Nevertheless, in the fall, the foliage is beautiful; in the spring, warming temperatures simply elicit happiness in general. A great study spot, but bring a blanket to lay on. If students wish to get away from the University of Rhode Island, three off-campus coffeehouses provide great locations to study. Brewed Awakenings, located in the South County Commons plaza, is just a short drive away from campus. Open from 5 a.m. to 9 p.m., this study spot may often be busy, so be careful! Getting a table can be tough, but they have an extensive drink menu, making it a spot well-worth the drive. Next, TLC Coffee Roasters sits on the moderately-busy Kingstown Road (Rt. 138), not too far from campus. This quaint building is home to many different types of coffee blends, sure to satisfy the caffeine necessity. Not as mainstream as a chain place, like Brewed Awakenings, due to its proximity to URI and its size, it can fill up fast. Finally, a true gem exists much further down Rt. 138, near the Richmond Stop and Shop: Higher Grounds Community Coffeehouse. 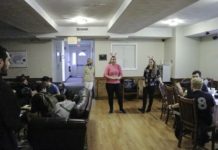 The epitome of “hole-in-the-wall,” this local favorite is far enough away from URI—and the opposite direction from Narragansett, where many students live—that it is seldom crowded. With plenty of room to study, and a large selection of snacks and coffee, this study spot is exceptional for students willing to drive a bit further from URI. On weekdays, it’s open from 6 a.m.-2 p.m.; Saturday hours are 7 a.m.-12 p.m., and it’s closed on Sundays.